The decentralized pharmacy model brings with it the opportunity for pharmacists to be an integral part of the medical team. This includes following teams of healthcare provides, physicians, nurses, respiratory therapists, etc, on morning rounds. And like all good little pharmacists we like to be prepared with as much information as possible about the patient. Several methods for collecting data have been developed over the years, including the all time favorite; the 3×5 index card. The problem with this system is obvious; it’s prone to human error. Taking information from one source and transcribing it somewhere else simply increases the chance for error. In addition, the information may be inaccurate as things can change rapidly with hospitalized patients, especially in areas like the ICU. Like many other professions, pharmacists don’t particularly like change. So when I offered to relieve them of their 3×5 index cards with a more high tech solution they were a little hesitant. It took some persuasion, but I was finally able to convince them that all the information they needed was readily available in electronic format. Unfortunately the information was scattered throughout several systems, requiring multiple clicks and views. The solution was to create a “rounds report” that would pull information from the various systems and display it in a single location. I’m certainly not an expert with database design, but I can get around ‘ok’. 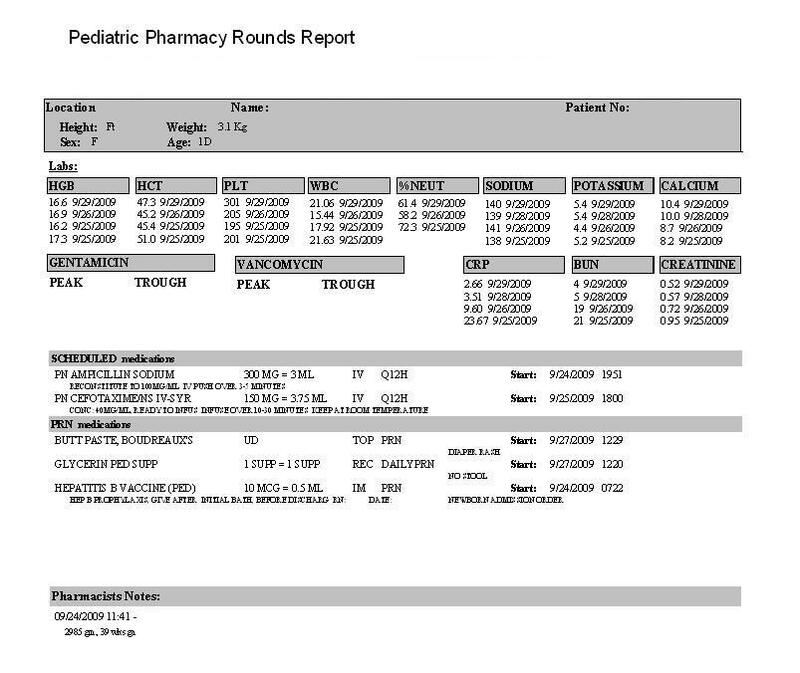 The report displayed below is the final version of the pediatric rounds report that was created. I also created one for ICU rounds. The information displayed in the report is pulled from various SQL tables on the back end of the pharmacy system in addition to a little visual basic used to grab the most recent lab values from the laboratory system. With a little encouragement I was even able to get the pharmacists to use the “Notes” section in our pharmacy system to leave information for each other regarding the patient. Paired with a tablet PC, the report has given the pharmacist a giant, electronic, real-time index card. Sweet! This would work nicely on an iPhone too, don’t you think? I’m with ‘ya, bro. I tried to get them to buy into a smaller handheld device, but they really didn’t have enough room on the screen to view everything they needed to see. Besides, with the tablet they also have easy access to all the online drug information we use. You could use an iPhone, but it would be much slower. You might want to look at a website called Roambi.com. I am not sure if you have run across it yet, but if you are an iPhone user it does a fantastic job of visualizing data in Excel. Yeah, that’s a great one. I’ll have to send you a photo…that’s what the label actually says! Thanks for the information on Roambi, Chad. I think I remember you posting something about this several months ago. Looks like a great app. You willing to share any screenshots from any of the Roambi files you created? I’d love to see what pharmacy data could look like. Take it easy.